Racoviteanu, A. M. W., R. Barry (2008). "Optical remote sensing of glacier characteristics: A review with focus on the Himalaya." Sensors 8(3356-3383). Focus of the paper is on the potential of visible and thermal infrared remote sensing data with GIS and field methods for estimating glacial characteristics. -Response of glaciers may also depend on ice dynamics, glacier hypsometry (the distribution of glacier area vs. elev) and topography. -Traditional direct glacier measurements used stakes and pits at representative points on glaciers. Snow pits are also dug and thickness of the accumulation layer is determined by grain size or the presence of a layer of dirt… these methods are of course tedious with a lot of manual labor. -Scenes aquired at the end of the ablation season are useful for identifying the end-of-summer snowline altitude (SLA) - considered to be related to variations in a glacier's mass balance and used as a surrogate for ELA on temperate glaciers. - Racoviteanu 2008. -The thermal band of ETM+ (10.4-12.5 at 60m) and the multispectral thermal bands of ASTER (8.125-11.65 at 90m) may provide the potential for distinguishing debris-cover on glaciers. Do you know of this? Could this be possible? -ASTER, SPOT5, IRS-1C and CORONA series can obtain stereoscopic images to monitor elevation data of the glacier surface in 3D. -The recently launched ALOS with it’s (PRISM) sensor could provide useful data as well – this whole paragraph is about other satellite technologies that could be used but I expect they are very expensive to obtain data for. -The paper states that ASTER imagery is available free to participants in the GLIMS project. Does our study qualify us for free ASTER Imagery? -The Equilibrium Line Altitude (ELA)- average altitude at which accumulation balances ablation over one year. The long-term steady-state ELA is a key indicator of the health of a glacier. annual ELA's that are higher than the steady state ELA's indicate a negative mass balance for that particular year. -Not going to note the whole description here but on page 3360 there is a great description of why each band is used to discriminate ice. -Page 3361 goes into a lot detail about methods and papers that deal with mapping debris covered ice. Is this something we could look at, perhaps using the ETM+ thermal band or a thermal band from Aster combined with the liDAR DEM and a color composite image. It would be interesting to look at the possibilities. Perhaps I could come up with a method to do this for each year. I’ll take a look at this after I have all the band ratio images processed and start working on the GIS half of this research. -Page 3362 discusses volume area scaling techniques for mass balance estimations but 3363 discusses that that the math involved may not work on smaller scale area’s with local climates like the NW and doesn’t account for debris covered ice and they assume steady state conditions which probably don’t exist on Hood or Rainier. -Paper discusses a Geodetic approach by subtracting older DEM’s from newer ones such as the LiDAR DEM. This may be possible. But, because of uncertainties this method should only be applied on the decadal or longer time scales. Volume changes are found by multiplying the difference in elevation by the pixel size. This would be worth looking into for Hood & Rainier possibly to validate ground mass-balance calculations in other studies. -Accumulation Area ratio/ELA methods for mass balance estimations – this looks more complicated and I would need to read more papers on these methods. This method requires in-situ measurements which I don’t know are available for Hood and Rainier. They may be from other studies. -The paper then goes into the case study of the HImilaya. The amount of papers and descriptive procedures for mapping debris-covered ice was the best part of this whole paper. When I start getting into the GIS portion of this research I will start to look at the possibilities of trying these methods. Dyurgerov, M. Glacier Mass Balance and Regime: Data of Measurements and Analysis. glaciers. PNAS 2000, 97 (4), 1406-1411. Kulkarni, A.V. Mass Balance of Himalayan Glaciers Using AAR and ELA Methods. J Glaciol 1992a, 38 (128), 101-104. Tangborn, W.; Rana, B. Mass balance and runoff of the partially debris-covered Langtang Glacier, Nepal, in: Debris-covered glaciers, A. Fountain, Eds; IAHS: Wallingsford, 2000; 264. 53 - 61. Bahr, D.B. Width and length scaling of glaciers. J Glaciol 1997, 43 (145), 557-562. Bahr, D.B. ; Meier, M.F. ; Peckham, S.D. The physical basis of glacier volume-area scaling. J Geophys Res B Solid Earth Planets 1997, 102 (B9), 20355-20362. Klein, A.G.; Isacks, B.L. Glaciers: tracking change in the central Andes Mountains. 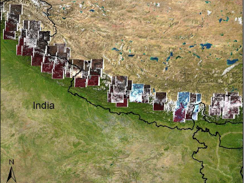 GIS World 1996, 9, 48-52.
modern glacier extents in central Nepal based on digital elevation data and satellite imagery. Quaternary Res 1998, 49, 241-254.
cumulative glacier length changes. Global Planet Change 2003, 36 (4), 295-306. Dozier, J. Remote sensing of snow in the visible and near-infrared wavelengths, in: Theory and Applications of Optical Remote Sensing, G. Asrar, Eds; John Wiley and Sons: New York, 1989; 527-547. Dozier, J. Snow reflectance from Landsat-4 Thematic Mapper. IEEE Trans Geosci Rem Sens 1984, GE-22 323-328. Hall, D.K. ; G. Riggs, A.; Salomonson, V.V. Development of methods for mapping global snow cover using moderate resolution imaging spectroradiometer data. Rem Sens Environ 1995, 54, 127-140. Landsat TM and digital elevation data. Int J Rem Sens 1999, 20 (2), 273-284.
elevation model for mapping debris-covered glaciers. Rem Sens Environ 2004b, 89 (4), 510- 518. Nakawo, M.; Rana, B. Estimate of ablation rate of glacier ice under a supraglacial debris layer. Geogr Ann Phys Geogr 1999, 81A (4), 695-701. Mattson, L.E. ; Gardner, J.S. ; Young, G.J. Ablation on debris covered glaciers: an example from the Rakhiot Glacier, Panjab, Himalaya, in: Snow and Glacier Hydrology. Proceedings of the International Symposium, Kathmandu, Nepal, 16-21 November 1992, G.J. Young, Eds; IAHS Publication, 1993; 218. Nakawo, M.; Morohoshi, T.; Uehara, S. Satellite data utilization for estimating ablation of debris covered glaciers, in: Snow and Glacier Hydrology. Proceedings of the International Symposium, Kathmandu, Nepal, 16-21 November 1992., G.J. Young, Eds; IAHS/AISH Publication, 1993; 218. 75-83. Khalsa, S.J.S. ; Dyurgerov, M.B. ; Khromova, T.; Raup, B.H. ; Barry, R.G. Space-based mapping of glacier changes using ASTER and GIS tools. IEEE Trans Geosci Rem Sens 2004, 42 (10), 2177-2183.
alpine glacier mapping. Polar Geogr 2001, 25 (3), 182-201. Bolch, T.; Buchroithner, M.F. ; Kunert, A.; Kamp, U. Automated delineation of debris-covered glaciers based on ASTER data. Geoinformation in Europe (Proc. of 27th EARSel Symposium, 04 -07 June 2007), Bozen, Italy 2007, 403-410. Nakawo, M.; Yabuki, H.; Sakai, A. Characteristics of Khumbu Glacier, Nepal Himalaya: recent change in the debris-covered area. Ann Glaciol 1999, 28,118-122. Suzuki, R.; Fujita, K.; Ageta, Y. Spatial distribution of thermal properties on debris-covered glaciers in the Himalayas derived from ASTER data. Bull Glacier Res. 2007, 24, 13-22. The thermal bands are too coarse for the size of the glaciers we are mapping. Jeff Phillippe explored this (with ASTER and TM) and had no luck. ASTER data are free (for me). Some SPOT data are now freely available. CORONA data are also available but very limited. I'm not sure if IRS data are free. The biggest problem with these is that they don't provide a long term record of observations. ASTER data only go back to 2000 and the SWIR band has been broken for over a year making it less useful for glacier mapping. ASTER and SPOT are pointable instruments and so the viewing angles of the observations change. Plus the observations are not made at the same time each year. Landsat is the best long term record since it is so consistent. If you want, I can order ASTER data for Hood and Rainier -- it's available for both for several years. At least it would give us some additional recent data. Take a look at Brooke Medley's MS thesis in which she used ASTER to map changes in the glaciers in the PNW. You can download it from the OSU library.